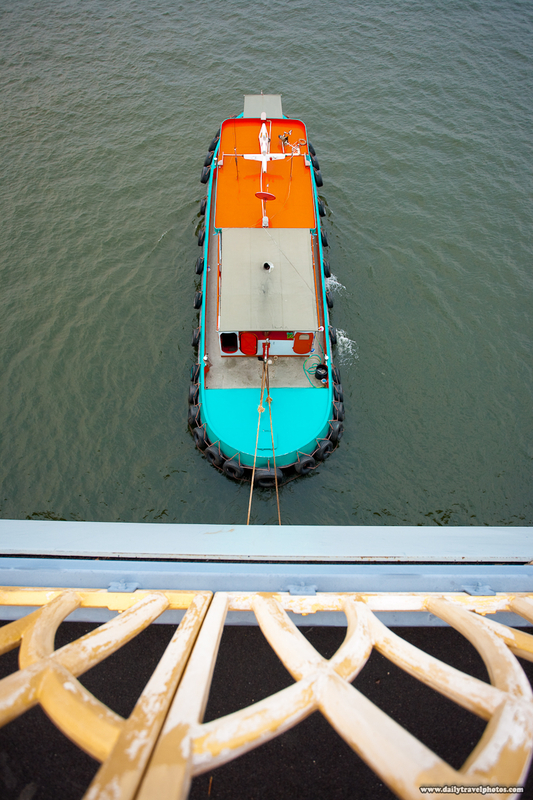 A tugboat lumbers up-river, seen from a top-down perspective on the Chao Phraya river in Bangkok. 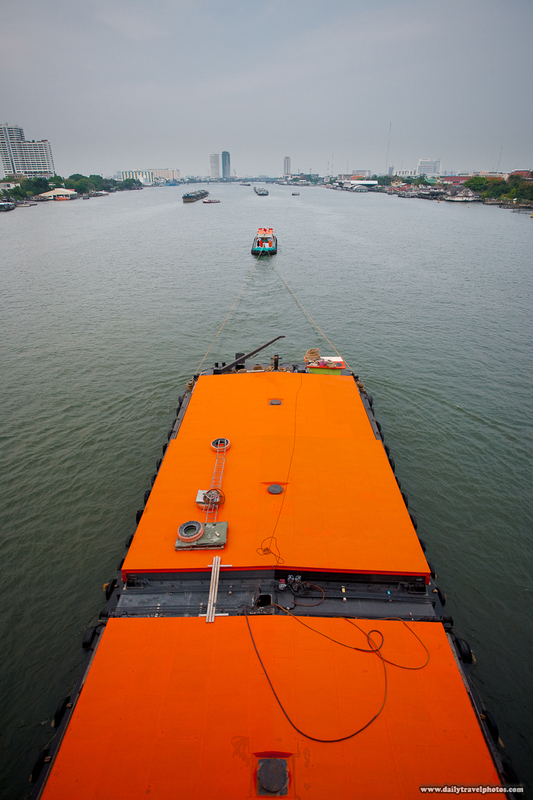 The Chao Phraya, a tidal river, is a major route for shipping. Overloaded barges ply the river in alignment with the tides which enable a relatively little boat to haul an oversized - and probably overloaded - shipment (see photo below). 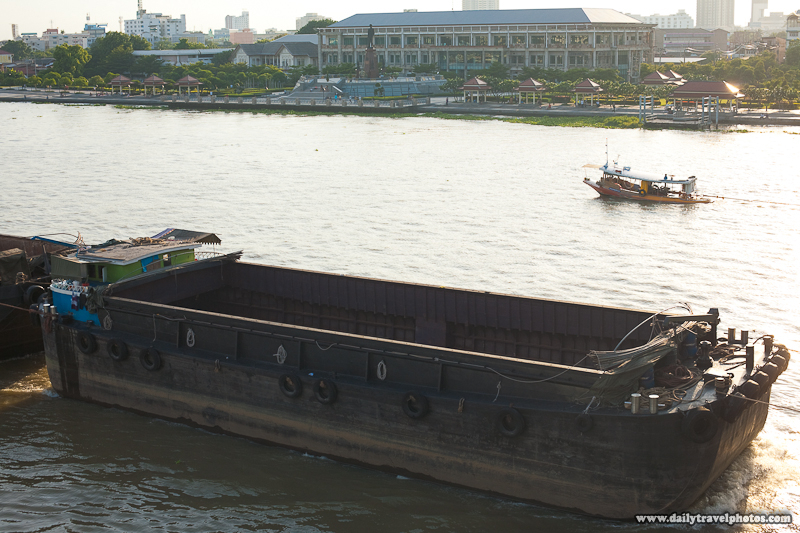 A small tugboat hauls an oversized load north on the Chao Phraya river in Bangkok. This particular barge spanned 4 separate sections (one and a half of which, you see here). The barges, are currently burdened with enough of a load that its roof is very near the surface of the water. When unloaded, the barge will rise a good 7 yards (~7 meters) above the water. It makes you wonder what these containers are holding... or more accurately, how many packages of my beloved Thai flat noodle it can store. An empty shipping barge heads up-river to load up once more with cargo. This is a late addition photo to this post, added on May 16, 2011 for a post 2 months earlier.